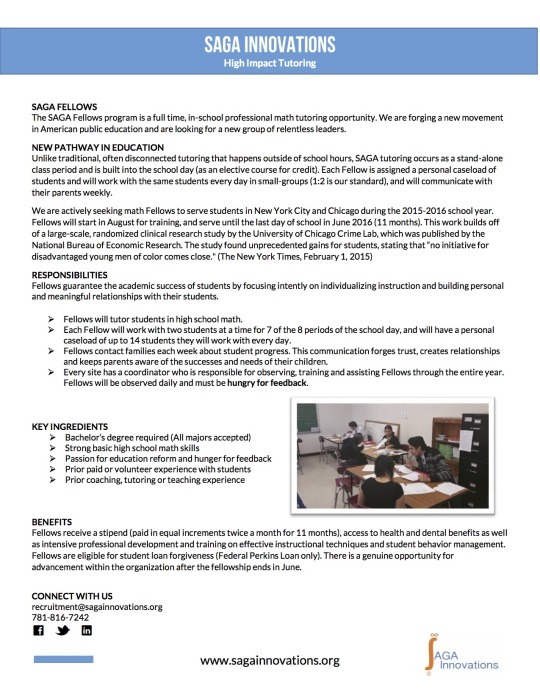 The SAGA Fellows program is a full time, in-school professional math tutoring opportunity. We are forging a new movement in American public education and are looking for a new group of relentless leaders. Unlike traditional, often disconnected tutoring that happens outside of school hours, SAGA tutoring occurs as a stand-alone class period and is built into the school day (as an elective course for credit). Each Fellow is assigned a personal caseload of students and will work with the same students every day in small-groups (1:2 is our standard), and will communicate with their parents weekly. Next Article Volunteer Abroad thru One Heart Source’s 2 – 8 week programs in Jamaica and South Africa!